Archaeologists have discovered a pebble mosaic in a 4th century B.C. bathhouse in the ancient city of Ambrakia (modern-day Arta) in northwest Greece. The mosaic predates the bathhouse but matches it thematically, depicting animals and settings with connections to water. 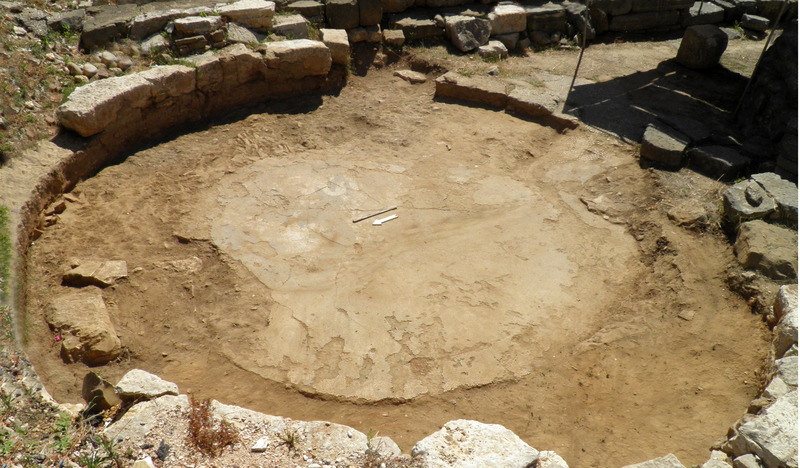 Discovered during excavations of the Small Theater archaeological site, the mosaic adorns the floor of a circular space just northwest of the theater. It is more than 12 feet in diameter and was made using small white, off-white and dark river pebbles. The weren’t painted or treated, but shine from the natural polish imparted by untold aeons spent in the river current. Decorative accents were created using amber and red pebbles. One small section in the northwest section of the mosaic shows evidence of having been repaired in antiquity. 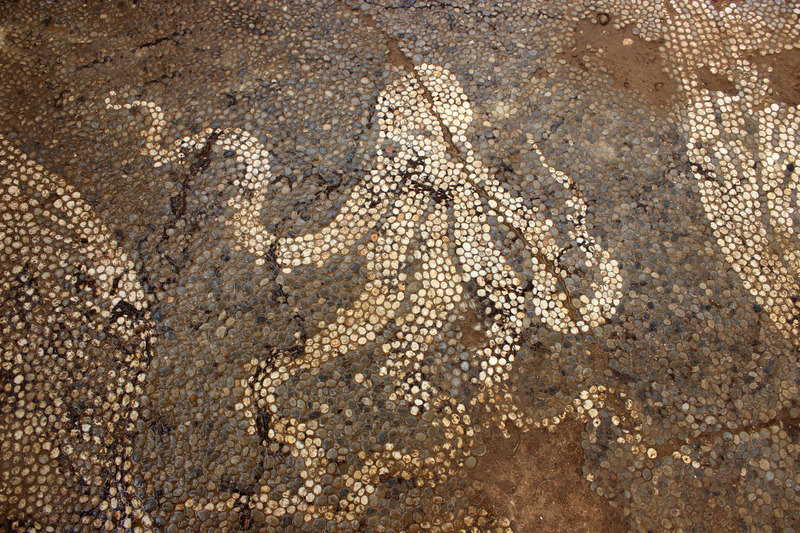 The mosaic is bounded by a spiral border one foot wide and in the center stars a five-tentacled octopus (pentapus?) with anime-large eyes. South of the cephalopod is a swan, wings spread as if attempting to take flight, with a rope around its neck that is held but a cupid figure standing on its right. In the southeast section is a dolphin with a cupid on its back. A female figure leads a swan in the west section, while in the northern section another cupid holds a swan by the leg. Also on the west side are two squirrels playing with something, toy or animal, that cannot be identified. To their right is a water fowl. The human figures have strips of amber pebbles over their torsos and arms, possibly representing scratches, and their lips are conveyed with pale yellow/cream pebbles. Facial features and details on the limbs are figured using very small pebbles. A similar pebble mosaic floor was found under the eastern section of the theater in the 1970s. 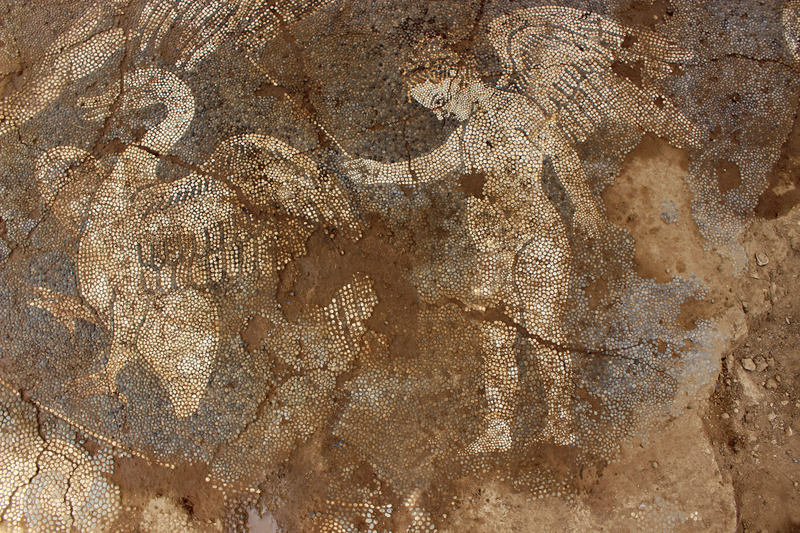 It also depicts winged cupids, swans and dolphins, but there are marked differences as well — the way the pebbles are embedded, the lack of color differences that convey dimension — which suggest it is older than the recently-discovered mosaic. It was raised in 1976 and moved the Archaeological Museum of Arta. This entry was posted on Monday, August 13th, 2018 at 7:53 AM	and is filed under Ancient. You can follow any responses to this entry through the RSS 2.0 feed. You can skip to the end and leave a response. Pinging is currently not allowed. The octo(pento)pus is utterly beautiful. To refine figures to graphic lines in three tones is evidence of a sophisticated master of the arts at work here, and using different size pebbles for finer details is astonishing and looks contemporary. Thank you for posting! Though a swan is more romantic I think we are looking at a goose. Both have yellow beaks but swan’s feet are black and white geese have yellow feet. The heavier stockier look also is more indicative of geese. I think both the dolphin and the goose are emblems of Aphrodite. PS: Geese are also “herded” with a switch like the cupid figure is shown doing. Particularly, the “heavier and stockier” rump was what made it look like a “goose” to me as well. As far as Aphrodite would be concerned, however, I reckon swans and geese would both be alright. If you google “Aphrodite riding goose ancient greek pottery” a beautiful wine cup interior will come up. I only recent saw a reference to the dolphin with cupid on its back saying that the dolphin was also a animal sacred to Aphrodite. Birth from the sea may be the association but I too am not sure of how the two connect further.